Anna Mitchael is like a lot of the women you know. In fact, she may even be a lot like you. In her fast-moving world, she might be called on as a friend, coworker, daughter, girlfriend, confidante, brat, cynic, or domestic-goddess-in-training. She's willing to juggle pretty much anything that gets thrown her way, but the one label she simply won't embrace is ma'am. Like so many bright-eyed college graduates before her, Mitchael begins her twenties armed with the conviction that the world is hers for the taking. And she discovers that it is, mostly—only no one told her just how often she’d have to pick herself up off the floor along the way. 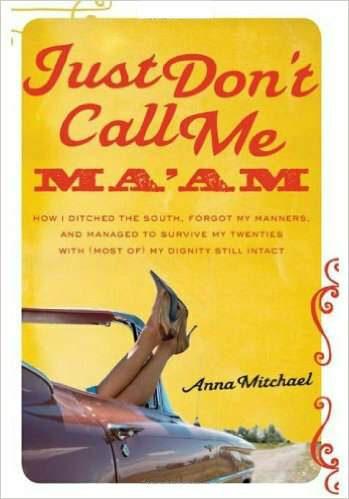 Written for every woman who’s experienced the ups and downs of trying to figure out who you’re really meant to be, Just Don’t Call Me Ma’am is a story of one woman and the choices that add up to be her twenty-something life—and of how sometimes you have to remember where you came from before you can figure out where you’re going. Anna Mitchael is a Louisiana-born author who now lives and writes on a ranch in Texas. She is the author of Copygirl, Rooster Stories and Just Don't Call Me Ma'am. For five years she has been a columnist about the country life for Wacoan magazine. Read more of her work on annamitchael.com. I love Southern snark. When I saw this book on my tbr pile I figured it would be worth a read. It was. In the beginning. Then it just sort of fizzled out from there. I laughed in the first few pages, and it felt so relatable, but by the end of it I was anticipating its' end. That's tough to say when it's someones' life story, but it was just a bunch of words to me. I didn't want to know some of the stuff I read. It just didn't interest me. This could be one of those spinach situations. It wasn't for me but it might be right for you. That's too bad. It certainly sounds like it has potential!